Learning to rock-climb is changing how I’ll teach math. Five years out of college—and taking a year off from teaching—I find myself in a precarious new position: dangling by ropes, 35 feet up a wall, a beginner again. Learning to rock-climb is as exhausting and fun as I’d hoped. I’ve spent hours rising and falling, hauling my body from Point A to Point B, returning home too drained for anything but Facebook and Orange is the New Black. I’d half-forgotten how exhilarating and vulnerable it feels to begin something. 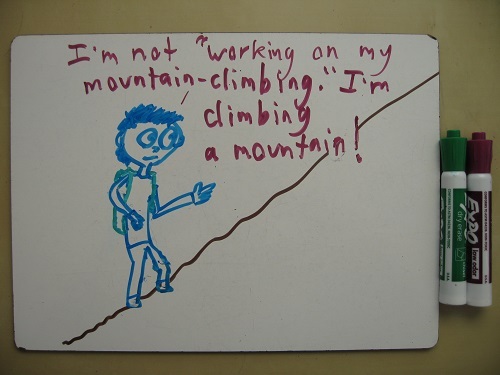 Because my mind exhales analogies (in much the same way that my body exhales CO2), I’m constantly drawing connections between rock-climbing and teaching math. In my own grunting and straining, I hear the graceless echo of my students’ efforts, but from the other side. Back in the classroom, I was the one holding the ropes, with two feet planted on flat, sturdy ground. I assured them not to worry, that I’d catch them if they fell. Now, I’m the one clinging to the wall, hoping like heck that the ropes don’t break. Here are the lessons I’ve learned up on the wall. Not the lessons about rock climbing, but the lessons about learning itself. 1. Just because you can do it doesn’t mean you can explain it. As a teacher, I always pressed for explanations. The approach baffled some students, who knew math demanded right answers, but had never bothered to issue detailed accounts of where those answers came from. Now, coming down off the wall, I land right where my students once stood. “How did you make it over that ledge?” I don’t know. “Did you use that foothold, or the one further out?” I couldn’t tell you. 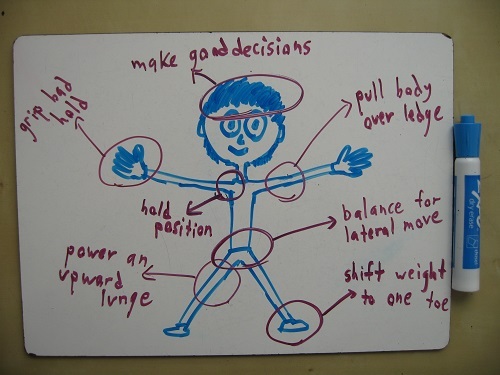 “Did you balance with your right hand and reach with your left, or vice versa?” No idea. I’m lost in the gray mist that my students know so well: I can do, but I can’t say why. The knowledge lives in my muscles and instincts, not in my verbal, reasoning mind. Rock-climbing has reminded me that, before you can explain your understanding, there’s an intermediate phase: knowing how without knowing why. 2. Ostensibly, it’s about long-term growth. But really, it’s about getting to the top of the wall. Now, rock-climbing, I’m the shortsighted one. Sure, I care about my health, my growth, my inching improvement over time. But I scarcely hear the whispers of those considerations over the deafening shout of my dominant goal: Get to the top of the wall. Who cares about that far-off, pie-in-the-sky stuff? There’s a wall right in front of me, begging to be climbed. It’s not necessarily that students don’t care about their slow, miraculous growth as people. It’s just that, like me, they don’t respond viscerally to such invisible progress. They respond when a wall beckons. 3. It isn’t one big skill. It’s a hundred little ones. When I started climbing, I quickly shed the naïve belief that only sheer strength matters. There’s different types of strength—the fingers, the calves, the back. There’s also balance—keeping control as you lunge upward, or shift weight, or delicately reposition your feet. And there are the mental and psychological skills—bravery, focus, opening your eyes to the options, choosing the wisest path. When you’re rock-climbing, you’re not just a pair of arms. You’re a whole body. 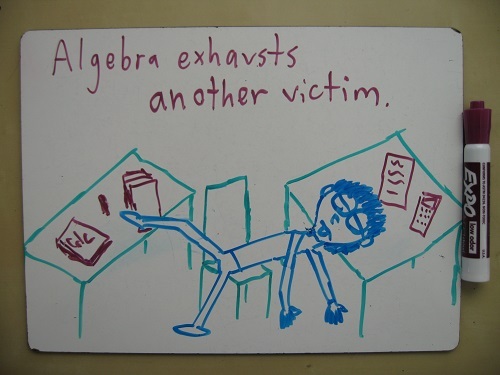 Too many students think math ability lies along a single axis. But soon they discover the sprawling taxonomy of mathematical skills. There’s speed—in computing, in connecting, in spotting errors. There’s organization—of arithmetic, of arguments, of ideas. There’s understanding—of concepts, of technicalities, of deep truths. And so on. When you’re doing math, you’re not just a single mechanism. You’re a whole brain. 4. You can rely on brute force, but it’s exhausting. A friend of mine likes to tease people for “climbing like a man.” You’ll see ripped guys, brand new to climbing, haul themselves up a tough route via brute strength. Muscles strain. Veins bulge. It’s quite impressive. And after a climb or two, they’re too exhausted to continue. They’ve mistaken “rock-climbing” for a series of pull-ups, and the misunderstanding quickly wears them out. Lots of students try to do math like a man. They stare intently at an example, and then tackle a practice problem, diligently striving to reproduce the method step for step. Sweat gathers on their brow. It’s a draining, painful process, and not at all how math is meant to be done. 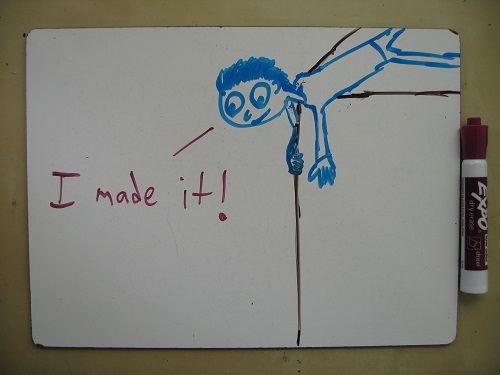 Like rock-climbing, math rewards the nimble. People who employ their full toolbox fare better than ones who rely exclusively on memorization and formalisms. Getting better at rock-climbing isn’t necessarily a visible process, with your muscles puffing up like balloons before your eyes. It’s similar in math. When new understandings arrive, there’s no ping announcing that your mental software has been updated. So we seek outward measures. In rock-climbing, it’s easy: When you scale a wall that you couldn’t before, you know you’ve grown. In math, it’s harder, so students turn to an obvious place: their test scores. If I want my students to obsess less over grades, I’ve got to give them new signs of progress to look for. One way or other, they need to see the fruits of their efforts, and they’ll keep turning back to test scores unless I can offer sweeter fruits. 6. Being told to do easy stuff is maddening. “I understand,” I reply, “but this easier problem will help us see what you’re missing on that harder one.” I never understood why they found the method so belittling. 7. There are easy cheats, but they undercut your improvement. On a given wall, different paths are marked out in different colored tape—pink, green, blue—designating which holds you should use. This makes it easy to cheat, if you want: just use a pink hold while you’re doing the green climb. But rock-climbers hate doing this. If they cheat by mistake—accidentally planting a foot where it doesn’t belong—they often ask to be lowered down to try again. They don’t just care about reaching the top of the wall, but about solving the puzzle as it’s meant to be solved. Students don’t share the same aversion—perhaps because math problems don’t come nicely labeled in green and pink. Instead, kids gladly take shortcuts that undercut their improvement, without even realizing that’s what they’re doing. They’ll apply dubious heuristics, or make true but unjustified assumptions. 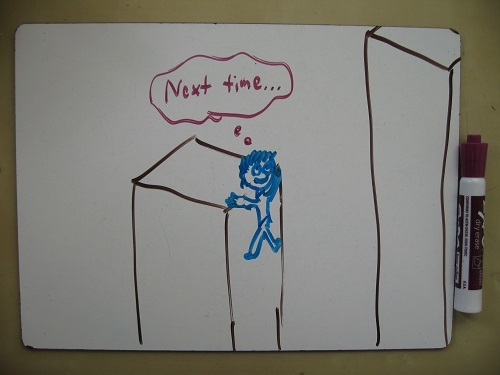 Rock-climbing suggests a solution: If students could see math problems the way rock-climbers see walls—as puzzles to be solved on their own terms—they might not leap so eagerly at cheap workarounds. 8. You’ve got to accept what you can and can’t do. The angriest I’ve ever been while climbing was when I failed at a route that I wanted to find easy. I’d set unreasonable expectations for myself, and when I didn’t meet them, it hurt worse than all the bangs on my elbows and bruises on my shins combined. Mine was a failure of self-knowledge. So are many failures in math class. Successful students need to know what they know, what they don’t know, and how best to convert ignorance into knowledge. They’ve got to know when to ask for help, when to persevere, and when they’ve hit the limits of their focus. The path to strength starts with identifying weakness. When I start a climb now, I coach myself just as I might coach a student. If this feels hard, that doesn’t mean you’re a failure. It means you’re doing the right thing to get better. There will be periods in both when you seem to be standing still, or even going backwards. But sometimes those periods where we seem to not be making progress are periods when we are consolidating skills, integrating skills, etc. It’s very hard to make a one-to-one correspondence between any particular mathematical activity and the understanding and thinking it reflects or develops. Sometimes you can’t explain even when you’re thinking is good; sometimes you can spit out what sounds like reasoning, but is really just parroting some sound bites. Similarly, doing very procedural work can involve a lot of analytical, deep thinking (in PhD courses I have to crank out basic examples *constantly* to understand what’s going on), and conversely working on non routine problems can be useless if you aren’t given enough guidance and you end up just rehashing a teacher’s derived solution. Ultimately, spotting the difference between thinking and repeating words, and encouraging and provided the tools for the former instead of the latter, is what makes a good teacher, not just a good curriculum, so important. Thanks for reading! You might also check out What It Feels Like to Be Bad at Math, Fistfuls of Sand (or, Why It Pays to Be a Stubborn Teacher), and The Anxieties of Hermit Crabs. Thank you for articulating how counterproductive it is to ask students to explain their strategy. The level of mastery needed for such knowledge can take years to attain. It demeans the accomplishment of the moment to suggest that it is incomplete without an explanation. Keep climbing and challenging yourself to learn difficult concepts – it will make you a better teacher to understand how learning occurs! While I agree that there is a difference between being able to do something and being able to explain one’s strategy, I would disagree with your notion that it’s counterproductive to ask students to articulate what they did. In fact, training students to make their thinking visible is one of the long-term goals in my classroom. I believe that there is a huge benefit to all the students in my class when they actively engage in discussions on how they solved problems. Is the skill of clearly explaining your work in solving a problem easy? Most certainly not. Is it an important life skill? Absolutely. 1. If students can’t explain their thinking perfectly, that doesn’t necessarily mean their thinking is wrong. 2. Asking kids to explain their thinking is still worthwhile as a window into their processes (though perhaps less worthwhile than I previously thought). 3. (someteacher’s point)To move forward in a discipline, it really helps to solidify your understanding, so it’s not just instinct, but can be explained clearly. That’s a phase that usually comes later, but it’s worth working towards gradually. This is a great post, Ben. Someteacher, I think you bring up an important point that while articulating one’s thinking doesn’t always correspond exactly to understanding, developing this ability is an important end in itself. A larger theme this discussion touches on is the general idea that it’s very hard to make a one-to-one correspondence between any particular mathematical activity and the understanding and thinking it reflects or develops. Sometimes you can’t explain even when you’re thinking is good; sometimes you can spit out what sounds like reasoning, but is really just parroting some sound bites. Similarly, doing very procedural work can involve a lot of analytical, deep thinking (in PhD courses I have to crank out basic examples *constantly* to understand what’s going on), and conversely working on non routine problems can be useless if you aren’t given enough guidance and you end up just rehashing a teacher’s derived solution. That’s really beautifully said. It helps me frame some experiences I’ve had, where my usual methods seemed to be succeeding superficially, but I knew they were failing to build deeper understanding. As you say, a good teacher responds flexibly to the needs of the student. I wish more teachers would take a meta-level interest in teaching like you seem to do. Well, judging by the comments here, I think a lot do! Hi Ben, this is a great post. It sums up a lot of my feelings towards maths pedagogy. 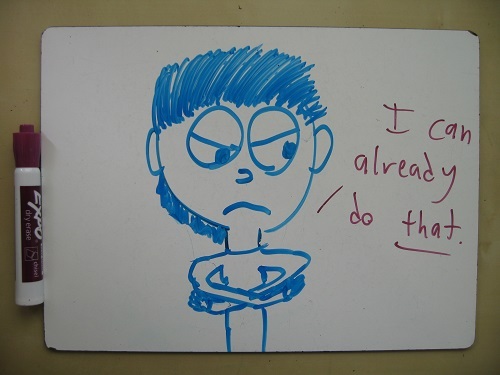 No.1 especially (“Just because you can do it, doesn’t mean you can explain it”) expresses my current feelings towards teaching year 7 fractions, a topic that I have been laboriously thinking about and planning so that I’m not just providing students with the ‘easy cheats’. Recently, I came across this quote made by Erwin Schrodinger in 1948, which nicely encapsulates some of the ideas expressed here: “In an honest search for knowledge, you quite often have to abide by ignorance for an indefinite period”. Thanks – that’s a great quote. Fabulous analogy! You’re really taking a year off teaching to rock climb? Are you still in Oakland? Well… a year off to tutor and write. The rock-climbing is how I fill some mornings here in Oakland. I’ll add another one. Like progress in climbing, progress is math is non-monotonic. There will be periods in both when you seem to be standing still, or even going backwards. But sometimes those periods where we seem to not be making progress are periods when we are consolidating skills, integrating skills, etc. I especially like number two. I frequently find that I need to stop and remind myself that what I am working on right now is all that there is right now. You are going to be in trouble if you keep writing too many of these, and your drawing starts to get good. “Math with Good Drawings” just doesn’t have the same ring. We may already be arriving at “math with slightly less bad drawings,” but don’t worry. “Good” is decades off! Yes! One of the hypotheses I found most striking in Intro Psych is that consciousness evolved late, and left the pre-existing unconscious brain mostly intact. Pingback: If This Feels Hard… | Let's Play Math! As a new teacher in HS physics as well as a well seasoned rock climbing instructor, this is awesome. The connections you have made between climbing and math (the language of physics) are outstanding. 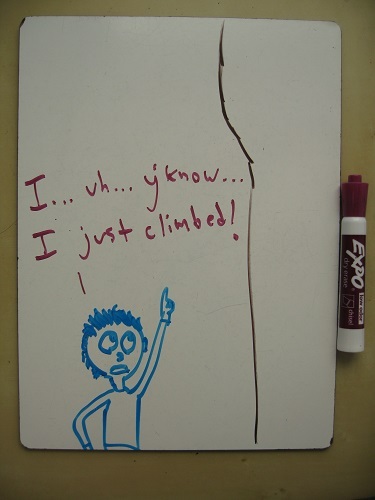 Have you tried using climbing in your teaching? While it can be tough to draw a parallel to a subject that your students are unfamiliar with, I find that often times you don’t need to be a master of something to understand the concepts. Keep up the good work and keep climbing. Ben, I am very angry with you. 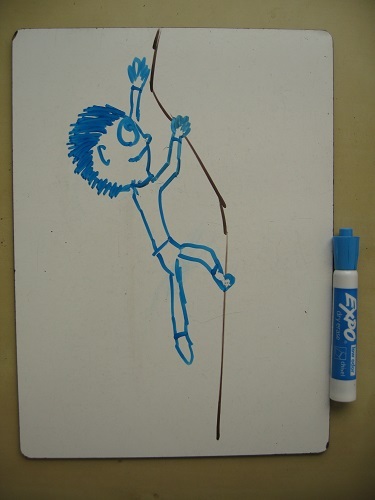 I have just started learning how to be a maths teacher, and also started to learn how to rock-climb. I had been writing a diary, in which I drew what I thought to be fantastic links between the two. Then I found this. Somehow you have traveled through time, stolen my ideas, and written them more eloquently. Very skillful, but very unfair.